Have you ever heard of the Freemie Collection Cups? If you are spending any of your time pumping your breasts, you may want to know about these! They are a type breast shield and collection device all in one designed to provide a hand free pumping experience. Sounds pretty cool huh? But, are they worth the money? Hopefully this Freemie collection cup review will help you make that decision! My Personal rating of this product is 8 out of 10! You already know that the Freemies are a combined breast shield and collection device. They do not require any hanging bottles like the traditional breast shields and they can be placed directly into your bra and can be concealed under most shirts with no problem. There are three options for purchase. The first one is the Freemie Deluxe Cup Set which includes the collection cups and tubing set and is compatible with Medela and Hygeia breast pumps. The second option includes the Freemie collection cups and tubing kit along with a conversion kit to allow compatibility with the following breast pumps- Lucina Melodi Prime, Phillips Avent Twin Electric & Comfort, Evenflow Advanced, and all Spectra models. 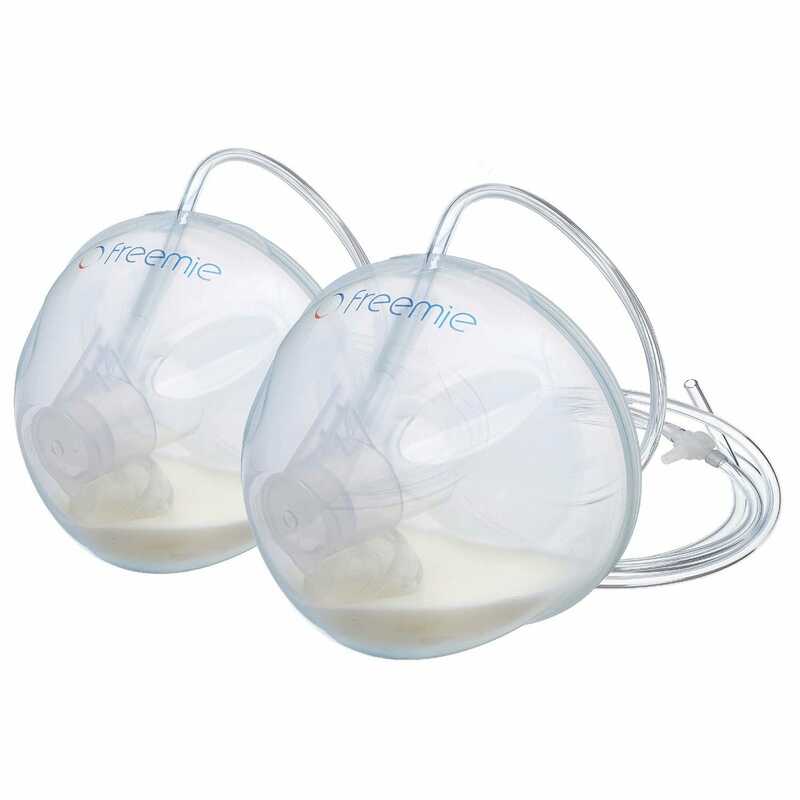 The last option is Freemie Deluxe Hands Free Pump Set which comes with the collection cups, tubing and an electric breast pump specifically designed for the Freemie collection cups. Provides a hand free pumping experience. Each cup holds up to 8 ounces of milk, so you can collect up to 16 ounces at one time. The visibility is poor. You can not easily see your milk stream like you can with other breast shields. You can not use the cups for storing the milk, like you can with a bottle system. You have to pour the milk into a storage container or bottle right after pumping. This needs to be done very carefully because it is easy to spill. I have personally found that these cups do not do as great of a job with emptying as the traditional style breast shield does, so I wouldn’t recommend them as your only breast shield. There is a 60 day warranty available on all Freemies products with a proof of purchase as long as there is no evidence of misuse, abuse or alterations of the products. Each kit comes with two hands free collection cups, two sets of funnels in size 24 mm and 28 mm, and tubing. The basic kit is compatible with medela and hygeia breast pumps. You can purchase the kit that comes with the conversion tubing, making it compatible with Spectra breast pumps and a few select other breast pumps listed above. There is an option to purchase a Freemie breast pump designed specifically for the freemie collection cups, which also comes with the basic kit. Personally I love the Freemies collection cups, I mainly use the Medela Pump in Style Advance for my pumping sessions. They are completely compatible with this pump with no conversion kit necessary. They are great for short day trips, work, doing chores around the house, and circumstances when privacy may be a problem. I would not use them as my go to breast shield for every pumping session because I do not feel they empty as well as the traditional set. I personally do not use them for my morning or nighttime pumping sessions. There is a risk of leaks and spilling milk if not careful, and I would not recommend doing any activities that require bending forward too far as leaking will occur. I would highly recommend this product to any working mom or mom on the go! They have been a lifesaver for me!! I hope you found this product review helpful! If you have any questions, comments or concerns please leave a comment! If you have any stories about the Freemie collection cups you would like to share, please drop a comment as well!! Thank you so much for this review! I have been wondering if I should purchase the Freemies collection cups for when i go back to work. After reading this review, i decided to give it a try! I can not wait until they arrive so I can test them out! Thank you for your comment Kayla, I am so glad I was able to offer you some insight into this product! I hope you find these collection cups useful! Please let me know how they work out for you after they arrive and you are able to test them out!